I grew up on what's left of the Martin plantation, a few acres of ground outside a little town called Sweetwater, Tennessee, about an hour or a little more south of Nashville. About halfway between Columbia and Pulaski, if that means anything to you. The mansion is antebellum, 1839, and looks like a Southern plantation should. In the movies, plantation houses are big and white and square with tall pillars. In real life, a lot are red or yellow brick, and only the pillars are white. Some aren’t made of brick at all, and don’t have any pillars. Throughout the deep south, especially Louisiana, you get the French Creole architecture instead: the low spreading roofline and wraparound galleries, all starting well above ground level. The Martin plantation is pretty typical of its age and location. It’s two stories tall, built from red brick, with symmetrical windows and tall, white pillars in the front. My sort-of-boyfriend Rafe Collier once called it a mausoleum, and although I was a little offended at the time, I can see his point. It belonged to my father’s family, and after daddy died, my mother turned it into a special events venue. People rent it for weddings and other parties, and at least once or twice a year, a photographer brings several rail thin models down for a photo shoot, while a handful of music videos have been filmed on the grounds. And then there are the school groups, who come to gawk at the slave cabin and the artifacts of the old days laid out in the smoke house. Every Christmas Eve, mother has a shindig for family and friends. It brings her children together under one roof, and since the mansion is almost 5,000 square feet, there’s plenty of room for all of us. My brother Dix has two children, and my sister Catherine and her husband have three. The whole family comes, including my Aunt Regina—my dad’s sister—and her husband, and my mother’s best friend Audrey. Various townsfolk come and go throughout the evening, paying their respects to the lady of the manor. The others don't stay the night, of course, since they live in town. I do. And in the morning, mother and I gather in the parlor for breakfast and presents. There's only one problem this year. The only thing I want to unwrap on Christmas morning won't be under the tree. He'll be in Atlanta. And even if he weren't, mother wouldn't welcome him in her home. And let's face it, it's not like I could have unwrapped him in the parlor anyway. So what about you? What would you like Santa to bring you for Christmas this year? Jennie Bentley AKA Jenna Bennett writes the Do It Yourself home renovation mysteries for Berkley Prime Crime and the Cutthroat Business mysteries for her own gratification. 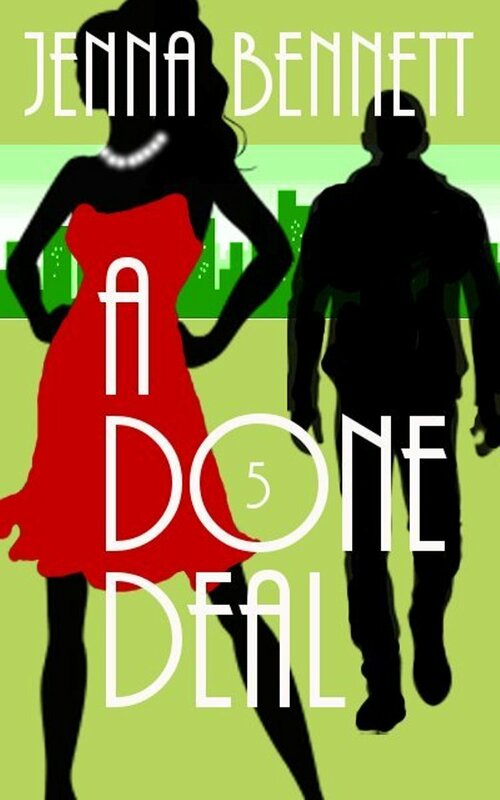 The 5th book in the series, A Done Deal, was released in digital format only on December 15th. You can find it on Amazon, Barnes and Noble, and Smashwords. What/who I'd like is also far off, on the West Coast. And rather than my heartthrob, he's my son. Won't happen though so I'll have a merry time here and he'll have one with his fiance. Maybe next year, Santa -- ok? I've asked Santa for a Kobo Vox this year as I'm getting more into ebooks and would love to have a device to read them on! I hope Savannah gets a great Christmas present this year! I hope Savannah gets to unwrap that present she desires. My niece and nephew are coming up for the holidays and that brings me joy.